Fbodywarehosue makes working on your third generation Camaro hood a snap. From replacement stock and aftermarket complete units to the small trim and latch parts you need. We have everything to make getting your hood right easy in one place! 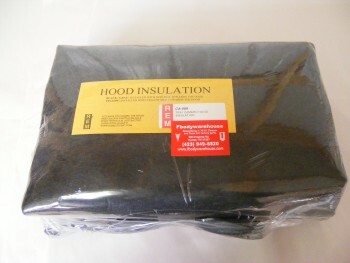 This is a hood insulation blanket and clips for 1982 - 1992 Camaro. This is a used GM center hood cowl stop. This mounts with the bolt included at the base of the windshield towards the center of the cowl on 1982 - 1984 Trans Am models. Very nice used GM condition. Removed from a 1984 Trans Am. New front sheet metal hardware set for 1982 - 1992 Camaro & Trans Am. For use on 1982 - 1992 Camaro Firebird Trans Am. If removing your seals for painting etc and you break a clip or two, why junk good seals when you can simply replace the clip that holds it in place? New rubber hood side stop kit for all 82 - 92 Camaro and Firebird models. They sit inside the fender 2 per side, and give the proper hood to fender spacing. Complete 4 piece kit for one car. Replace your missing or broken clips today! Sold in a 4 piece package.